Everyone has a creative side even little tots. The art easel is a great way to show to your little ones creative side. Paint away on this great easel. Everyone has a creative side even little tots. 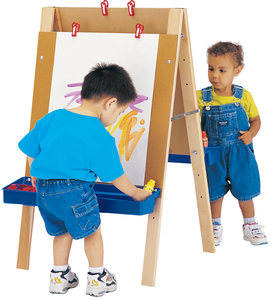 The art easel is a great way to show to your little ones creative side. Paint away on this great easel. Art at toddler's height. Jonti-Craft, the leading provider of quality furniture for the early learning market, offers a wide selection of creatively designed products. From our KYDZSafe® edges to our KYDZTuff® finish, you’ll find that all Jonti-Craft products are packed with features that make them safe, functional and affordable. Every single corner and edge of our products are rounded for safety. And, since we are the only early learning furniture manufacturer to use both birch and Rainbow Accents® materials, your furniture options are endless. To top it off, Jonti-Craft products are built using the strongest construction techniques available to ensure that your furniture purchase will last a lifetime!